Senior Dusty Page (Germantown, Wis./Kettle Moraine Lutheran) of the NIU men’s soccer team was named to the CoSIDA Capital One Academic All-District Men’s Soccer Team announced on Thursday. A finance major with a 4.0 GPA, Page has started all 15 matches thus far for the Huskies, playing 1,338 minutes, the most for a NIU field player this season. The Germantown, Wis., native has recorded one assist this season, on the game-winning goal against Quinnipiac on Aug. 31, while also helping the Huskies record four shutouts. “This is a great honor for Dusty, who is a pretty amazing young man,” said NIU head coach Eric Luzzi. “He is our team captain; he is extremely active with the SAAC Committee, both at NIU and with the NCAA, and the fact that he maintains a 4.0 GPA in our most demanding major says a lot about how talented and focused Dusty is. 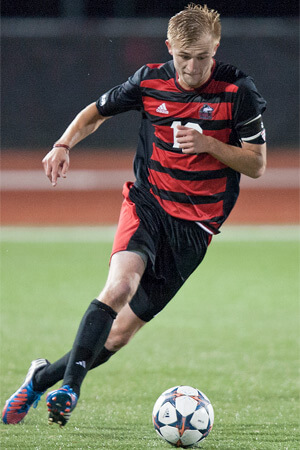 Page, who also serves as vice chair of the NCAA Division I Student-Athlete Advisory Committee (SAAC), has played in 47 matches during his four-year NIU career, including 41 starts. This is the second consecutive season that Page has received CoSIDA Academic All-District honors, he was also an Academic All-MAC selection in 2013. To be eligible for Academic All-District consideration, a student-athlete must be a starter or key reserve, maintain a cumulative G.P.A. of 3.30 on a scale of 4.00 and have reached sophomore athletic and academic standings at his/her current institution. Academic All-District honorees advance to the Capital One Academic All-America Team ballot, where first-, second- and third-team All-America honorees will be selected in November. Page and the Huskies will return to action Saturday, Nov. 1, when they host Akron. Game time against the Zips is scheduled for 7 p.m. at the NIU Soccer & Track and Field Complex.